A wrestling ring is the stage on which professional wrestlers wrestle. The configuration and construction of the traditional wrestling ring closely resembles that of a boxing ring. Like boxing rings, wrestling rings are also known by the poetic name of the "squared circle". Wrestling rings are generally composed of an elevated steel beam and wood plank stage topped by foam padding and a canvas cover. Most wrestling rings typically have more padding and shock-absorbing construction than boxing rings. Around the ring are three ring ropes, one fewer than modern boxing rings, which has had four ropes since the 1970s. The materials used for the ropes differ depending on the ring builder or promoter. Some, like WWE, use natural fiber ropes wrapped in tape, others use steel cables that are encased in rubber hose. Unlike a boxing ring, the ring ropes in a wrestling ring are not tethered together. These ropes are held up and tensioned by turnbuckles, which, in turn, hang on steel pole ring posts, which are integrated with the frame. The ends of the turnbuckles facing into the ring are padded, either individually, or with a large pad for all three similar to a boxing ring, as in New Japan Pro-Wrestling. A portion of the mat extends outside the ring ropes, known as the ring apron. The elevated sides of the ring are covered with a fabric skirt to prevent spectators from seeing underneath. Usually around ringside there are steel steps that wrestlers can use to enter and exit the ring. All parts of the ring are often used as part of various offensive and defensive moves. Wrestling rings vary in shape and size, with most measuring between 14 and 20 feet on each side, measured between the turnbuckles. WWE uses a 20-foot by 20-foot ring, while in the past World Championship Wrestling and Extreme Championship Wrestling used, and Impact Wrestling and Ring of Honor currently use, an 18-foot by 18-foot ring. Typically, wrestling rings are smaller than boxing rings. A hexagonal wrestling ring, which has been used by Impact Wrestling in the past. AAA in Mexico occasionally uses similar rings. While the traditional ring is four-sided, other configurations exist, such as six-sided rings, which have been used by Impact Wrestling and occasionally by Lucha Libre AAA World Wide (AAA). 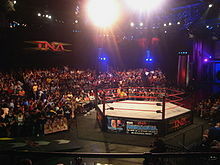 Impact, then known as Total Nonstop Action Wrestling (TNA), first used it beginning in 2004, before reverting to a four-sided ring in 2010. In June 2014, the six-sided ring returned, but was dropped again in January 2018. ^ a b c Ellison, Lillian (2003). The Fabulous Moolah: First Goddess of the Squared Circle. ReaganBooks. p. 199. ISBN 978-0-06-001258-8. ^ "Photo Of The New TNA Six Sided Ring - WrestlingInc.com". WrestlingInc.com. Retrieved 2017-12-11. ^ "Impact on Twitter: "See it here first"". January 10, 2018. Retrieved January 10, 2018.